Why would you need content tracking? Let’s say that you have a long landing page and you are wondering if visitors are even looking at the lower parts of the content. In a basic mode, Piwik web analytics tracks the number of pageviews, but does not track percentage of content that was displayed during the pageview. This is where we can use the content tracking feature to check if our content is being read by our visitors. 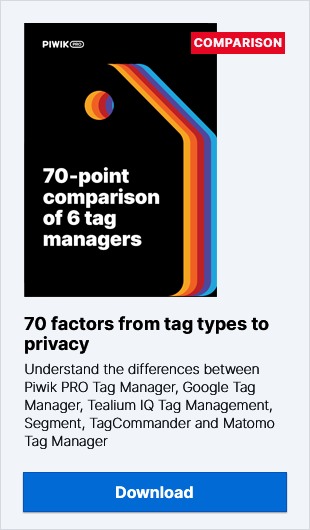 To implement this option, we need to configure some additional elements in the source HTML of our page and add implement the appropriate Piwik features via Piwik PRO Tag Manager. Content Name refers to a batch of the content we want to track. Content Piece refers to one of the elements of the Content tracking. Data about both of these is stored in the Contents report which can be found in under the Actions option in the main menu. In our example, we want to define two content pieces of which the first is followed by the second. The first piece will be called 1st set and the second one accordingly 2nd set. Both content pieces will be under one Content Name On-Premises LP Features. To help Piwik recognize these HTML elements, we need to add some things into the Piwik code. We will do this using Piwik PRO Tag Manager. We will use this one because we want to know if our content is visible for users or not. We can implement the correct option in two ways. It all depends on how we have implemented our main Piwik code. you have to create a new tag to insert additional snippet into the code. We set an easily recognizable Trigger Name. We have choosen Page View from the Loads on and On state menu. We have set the correct Condition for a trigger – Page URL contains “on-premises-self-hosted-enterprise-web-analytics” because the URL of the landing page is https://campaign.piwik.pro/on-premises-self-hosted-enterprise-web-analytics/. We have saved the trigger configuration by clicking Add and Save after that. As you can see, we now have new data about our content pieces.